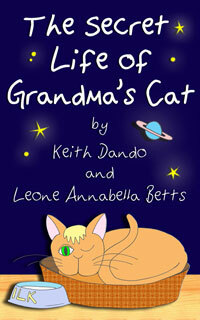 “The Secret Life of Grandma’s Cat” takes the form of a short, humorous story, told entirely in verse. Keith and I chose to write it this way because we both remember that when we were children, we always liked books which rhymed. It tells the story of a cat and mouse who go on secret adventures together, in the cat’s flying milk saucer. If you have a Kindle, you can get “The Secret Life of Grandma’s Cat” on amazon.co.uk if you’re in the UK, amazon.com if you’re in the USA. You can also check out my Amazon author profile, which will give you a list of all the Amazon books I’ve worked on. “The Secret Life of Grandma’s Cat” is now part of a series of adventures featuring Captain Cat and Astromouse, called “The Adventures of Grandma’s Cat”. Book two in the series is now available and book three will be coming out later this year. All Grandma’s Cat Kindle books are priced at £0.99 ($1.31).